Provide comfort for the family of Jimmy McDaniel with a meaningful gesture of sympathy. James Grey "Jimmy" McDaniel, Jr. age 72 of Thomasville, AL died April 7, 2019 at his home. He was born February 7, 1947 in Selma, AL to James Grey and Sylvia Marcheta McDaniel. He was a retired maintenance coordinator with International Paper Co. and was a member of Pineview Baptist Church. He is survived by his wife, Vida A. McDaniel; two sisters, Lee Belcher and Pat Taylor (Elmer); brother, Mike McDaniel (Champ); sister-in-law, Dora Thomas; and brother-in-law, Joe Agee (Julie). Memorial services will be held at Pineview Baptist Church on Wednesday, April 10, 2019 at 11:00 am with Rev. Mitch Thrower, Rev. Scott Myers, and Rev. Benny Harrison officiating. 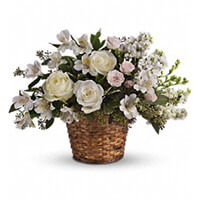 To send flowers in memory of Jimmy McDaniel, please visit our Heartfelt Sympathies Store. Greg and Paula Sullivan sent flowers to the family of Jimmy McDaniel. Greg and Paula Sullivan purchased the Love's Journey for the family of Jimmy McDaniel. May the family of Jimmy McDaniel please accept my sincere condolences hoping you find comfort in God's words at Acts 24:15 and Psalm 37:29.